Four-year-old Rylie Laber was coughing repeatedly, incited by a flare-up of asthmatic bronchitis. 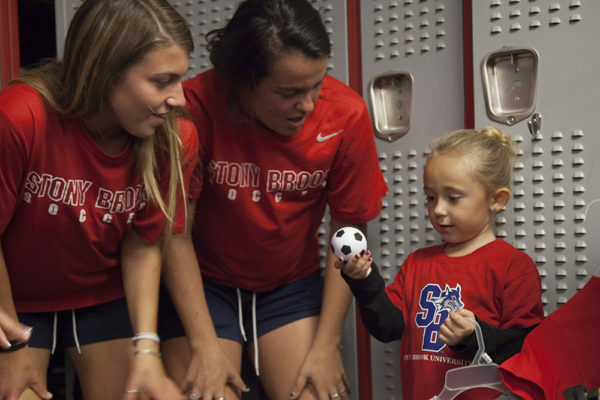 But despite the outburst, her grandmother and legal guardian, Mary Baling, could not convince Rylie to miss a Stony Brook Women’s Soccer game. The bout was hardly a rare occurrence. Rylie suffers from a congenital disorder called Shwachman-Diamond Syndrome (SDS) that deteriorates one’s immune system, causing bone marrow frailty and pancreatic insufficiency, as well as leading to skeletal abnormalities and growth issues. But no matter the infliction, she can be found at Kenneth P. LaValle Stadium when her team takes the field. Rylie has attended all but one of the women’s soccer team home games this season and is with the team during Saturday practices as well. She needed to be with her teammates on the sidelines to support them, just as they have supported her. After a ‘Draft Day’ ceremony last Friday, the four-year-old became the newest member of the Seawolves. In front of her new teammates and loved ones, she was the star of the day, as she signed a mock contract to become a member of the team. She received an official locker in the team locker room and an official Stony Brook game jersey that bears her name. With the help of Team IMPACT, an organization that connects courageous children battling illness with local college athletic teams, Rylie was able to connect with the women’s soccer team. 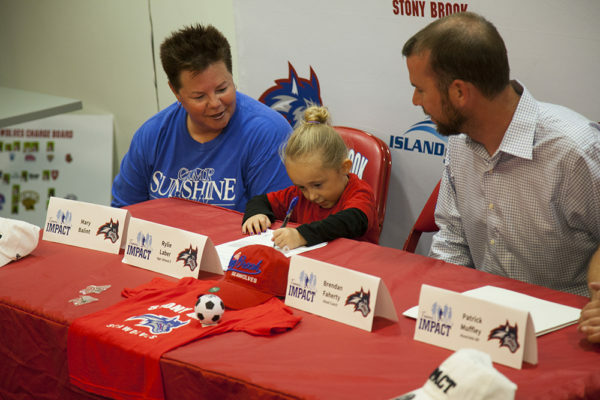 Team IMPACT took into account how she played on pee-wee soccer and lives just minutes away from Kenneth P. LaValle Stadium when pairing Rylie with Stony Brook’s women’s soccer team. The pairing is designed to help her gain great strength, camaraderie and support, according to Team IMPACT’s website. Despite all that she has endured and is still going through, Rylie is getting through it knowing she has her girls on her side. Whether she is collecting pinnies after practice or rushing to give players water as they come off the field, Rylie will do anything for the team with a smile on her face — a smile that the team cannot get enough of. Hutchinson and Vaughn are part of a six-person leadership team comprised of players on the roster. Though it is truly a combined effort, they are responsible for making sure Rylie has a great time, not only at games, but also off the field planning fun activities with her. Rylie is a fighter and pushes harder every day to get through her health problems because she knows she has a game to go to. She has 32 role models in the Seawolves, and each of them give her the motivation and confidence she needs to keep pushing. Rylie is not just a part of the 2016 women’s soccer team, she is going to be on the sidelines cheering this program on for the foreseeable future.